Recently, I've written several reviews about belated sequels -- movies which arrived years, sometimes decades after the last entry in the series. As Hollywood loves to recycle ideas, it shouldn't be surprising to see the appearance of a belated revival of a television show as well. After a ten year run which saw some ups and downs, The X-Files went off the air in 2002. The characters were revived in 2008 with the disappointing (understatement) feature film The X-Files: I Want to Believe. The performance and quality of that movie convinced me that The X-Files were done. But, 2016 saw the return of the show in a six-episode "event". Will series creator Chris Carter and co. be able to re-capture the magic of the show's early years. The X-Files: The Event Series is divided into six episodes. "My Struggle" -- Right-wing talk show host and conspiracy theorist Tad O'Malley (Joel McHale) contacts Fox Mulder (David Duchonvy), who has retired from the FBI claiming to have information about a government cover-up of aliens. Dana Scully (Gillian Anderson), who is working as a surgeon, accompanies Mulder to visit Sveta (Annet Mahendru), a young woman who O'Malley purports was abducted. As Mulder and Scully look into this, Mulder realizes that his decades held theories about aliens was wrong. "Founder's Mutation" -- Mulder and Scully investigate the suicide of an employee at a genetics research lab. This leads them on the trail of a group of a children who were the subject of experiments. "Mulder & Scully Meet the Were-Monster" -- Mulder is drawn to a case when it's reported that a reptilian monster has attacked and killed several people. The investigation leads the duo to a case which turns all monster legends on their heads. "Home Again" -- Individuals involved in attempting to relocate inner-city homeless people are being killed. As Scully deals with a family crisis, Mulder finds that the murder are somehow tied to a legendary urban figure who is portrayed in graffiti. "Babylon" -- A terrorist who has been involved in a suicide bombing lies in a coma. Agents Miller (Robbie Amell) and Einstein (Lauren Ambrose) approach Mulder and Scully for assistance, at they attempt to find a way to communicate with the suspect. "My Struggle II" -- The story from the first episodes continues, as an epidemic begins to sweep the nation. Scully becomes convinced that it is linked to DNA tampering perpetrated by the government and that her own blood may hold the key to a cure. I've written in the past about how I was a fan of The X-Files from the beginning and for several seasons, I was a loyal devotee of the show. However, I began to find the show exhausting and frustrating due to its dichotomous nature. Episodes of the show fell into two categories; free-standing "monster of the week" episodes in which Mulder and Scully would travel to a location to solve a mystery; and those which tied into the many government conspiracies that the show followed. While it was a conspiracy which drove Mulder (the disappearance of his sister), I preferred the stand-alone episodes, not only because they showed more creativity, but because they carried far more energy. Not unlike Lost, The X-Files continually wrote itself into a corner and provided far more questions than answers. This is what makes The Event Series so weird. The first and last episodes fall directly into the old canon shows which feature alien conspiracies and the Smoking Man (William B. Davis). I had actually planned to watch this show when it aired, but I couldn't make it through the aptly titled "My Struggle", as the somber tone and Anderson's lethargic performance, combined with the return of the arduous paranoid storylines literally put me to sleep. "My Struggle II" plays like an episode of House, and it's story borders on absurd. The middle four episodes are classic "Monster of the Week" episodes and deftly demonstrate how creative, touching, and funny the show can be. While it's a bit jarring that Mulder and Scully are suddenly back at their old jobs following the events of "My Struggle", fans like myself will rejoice at seeing the duo back in their old roles. The sense of wonder with which Mulder approaches his work is a big part of the show's appeal and we get a good dose of that here. The storylines and motivations presented here play like a greatest hits of classic episodes from the original series. I suppose the fact that I liked 2/3 of the episodes in The Event Series meant that I liked it. Still, I can't help but come away disappointed. For starters, the box proclaimed "All Questions Answered". Well, that didn't happen. This flat-out lie is compounded by the fact that this mini-series ends with a cliffhanger. Are they planning on making more? I would certainly hope so, as the ending is quite unsatisfying. Also, what's up with Miller and Einstein? Are they going to be in a spin-off? It was great to see these beloved characters again, and I really liked some of what was presented here, but it also reminded me of why I bailed on The X-Files in the first place. 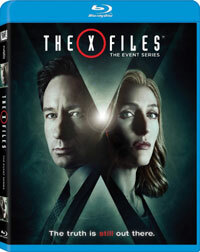 The X-Files: The Event Series still owes me a lot of answers on Blu-ray Disc courtesy of 20th Century Fox Home Entertainment. This two-disc set contains all six episodes of this series. The show has been letterboxed at 1.78:1 and the Disc contains an AVC 1080p HD transfer which runs at an average of 26 Mbps. The image is very sharp and clear, showing no noticeable grain and no defects from the source materials. The colors look very good and the image is never overly dark or bright. The level of detail is impressive, as the picture is never soft and the depth works well. The Disc carries a DTS-HD Master Audio 5.1 track which runs at 48 kHz and an average of 3.5 Mbps. The track provides clear dialogue and sound effects. The stereo and surround effects are nicely done, as they provide notable effects during the "big" moments. Some of these effects show good detail. We are also treated to sounds coming from off-screen courtesy of the front and rear channels. Overall, this package certainly rivals HD broadcast quality. The X-Files: The Event Series Blu-ray Disc contains a selection of extra features. Disc 1 kicks off with an AUDIO COMMENTARY for the episode "Founder's Mutation" from Series Creator Chris Carter and Director James Wong. This is followed by another COMMENTARY for "Mulder & Scully Meet the Were-Monster" by Duchovny, Anderson, Kumail Nanjiani, and Darin Morgan. The extras are continued on Disc 2, where we find an AUDIO COMMENTARY on "My Struggle II" by Series Creator Chris Carter and Co-Producer Gabe Rotter. The Disc contains two DELETED SCENES which run about 5 minutes. "43:45 -- The Makings of a Struggle" (54 minutes) is a five-part featurette which gives an overview of the revival. This is a very in-depth piece which takes us inside the concept and making of "My Struggle". We go on-set and get comments from Duchovny, Anderson, Carter, other actors and the creative team. "Season X" (83 minutes) is a series of 14 segments which delve into the making of the new episodes. This delivers interviews with many of those responsible for the show and looks at the planning and production. We get a 10-minute GAG REEL. "Monsters of the Week" (11 minutes), hosted by Kumail Nanjiani, looks at some of the best moments from the original series. This does bring back some classics and contains some nice jokes. "The X-Files: Green Production" (3 minutes) looks at the economic awareness of the show. "Grace" (10 minutes) is a short film from script supervisor Karen Nielsen.